Hybrid Pro Modular Kit 11 is a stylish modular exhibit with depth and dimension making it a great way to establish yourself as a veteran at any venue. The modular display frame is heavy-duty and durable. With available features like push-fit graphics, shelving, tables, monitor mounts, storage areas, and much more. The Hybrid Pro Modular series is a cut above the rest when it comes to quality. Make yourself stand out at your next event with the Hybrid Pro series backwall. Backwall Counter: 21.75"W x 38"H x 17.75"D approx. Hybrid Modular Display 20ft Timberline Trade Show Booth Package The Timberline display is p.. Hybrid Modular Display 20ft Timberline Trade Show Booth Package B The Timberline display.. Hybrid Modular Display 20ft Maple Wall Trade Show Booth Kit C The Timberline display is part ..
Timberline Hybrid Modular Booth 20ft Slat Wall Trade Show Display Kit D The Timberline displa..
Modular Backwall Hybrid Pro 20ft Kit 12The Hybrid Pro Modular Kit 12 is a stylish modular exhibit w..
Tradeshow Modular Hybrid Pro 20ft Backwall Kit 13The Hybrid Pro Modular Kit 13 is a stylish modular .. 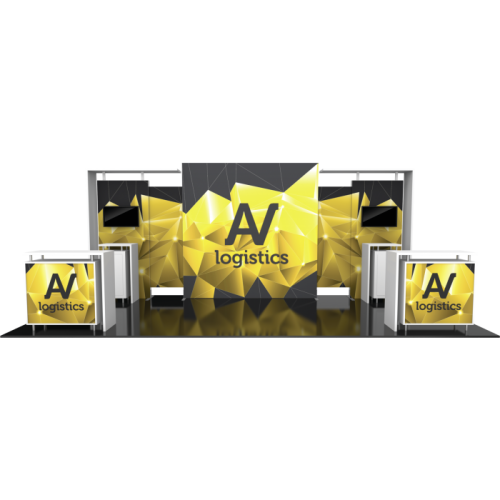 Custom Hybrid Pro 20ft Modular Backwall Kit 14Hybrid Pro Modular Kit 14 is a stylish modular exhibit..